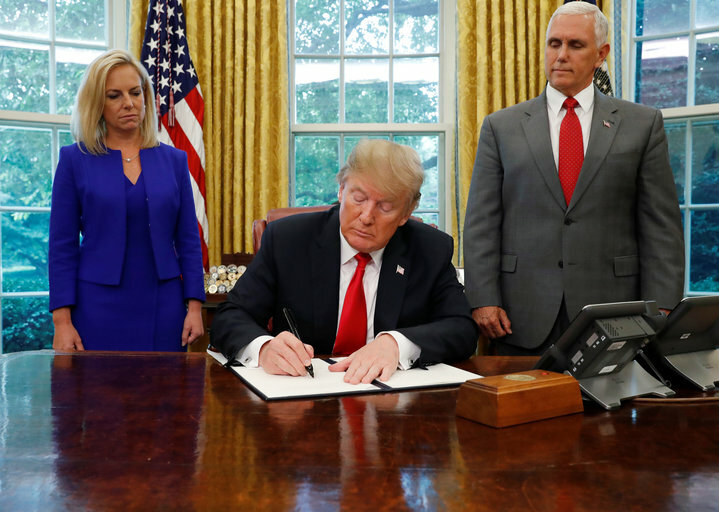 On June 20, 2018, President Trump issued an executive order captioned "Affording Congress an Opportunity to Address Family Separation". The purpose of that order is to maintain alien family units (including minors) in immigration custody throughout any prosecution of alien adults in those units for illegal entry and until those family units are removed from the United States, or alternatively granted relief. There are two significant provisions in that order. Section 3(a) therein states that the Department of Homeland Security (DHS) "shall, to the extent permitted by law and subject to the availability of appropriations, maintain custody of alien families" throughout both the criminal prosecution of any adults who have entered illegally and any subsequent removal, or expedited removal, proceedings. Why is this important? Section 462 of the Homeland Security Act of 2002 vested jurisdiction over the care and placement of unaccompanied alien children (UACs) in removal proceedings with the Office of Refugee Resettlement (ORR) in the Department of Health and Human Services (HHS). The Trafficking Victims Protection Reauthorization Act of 2008 (TVPRA) expanded on HHS's jurisdiction over UACs. Under section 235 of the TVPRA, UACs are separated into two groups: those from contiguous countries (Mexico and Canada), and nationals of all other countries. Under section 235(a)(2) of that act, a UAC from a contiguous country can be returned if that UAC has not been and will not be a "victim of a severe form of trafficking in persons", does not have a credible fear, and "is able to make an independent decision to withdraw" his or her application for admission. The TVPRA mandated that unaccompanied alien children from countries other than Mexico or Canada — along with UAC from those countries who are apprehended away from the border — are to be transferred to the care and custody of HHS and placed in formal removal proceedings. Specifically, section 235(b)(3) of the TVPRA directs "any department or agency of the Federal Government that has an unaccompanied alien child in custody" to "transfer the custody of such child to [HHS] not later than 72 hours after determining that such child is an unaccompanied alien child." [A] child who-- (A) has no lawful immigration status in the United States; (B) has not attained 18 years of age; and (C) with respect to whom — (i) there is no parent or legal guardian in the United States; or (ii) no parent or legal guardian in the United States is available to provide care and physical custody. If an adult is referred for criminal prosecution, the adult will be transferred to U.S. Marshals Service custody and any children will be classified as an unaccompanied alien child and transferred to [HHS] custody. By maintaining family units in DHS custody, pursuant to section 3(a) in the EO, while the alien adult parents are prosecuted under section 275(a) of the Immigration and Nationality Act (INA) for illegal entry, the administration will avoid having to refer their alien children to HHS under the terms of the TVPRA. This will avoid family separation, at least in the short term. In the longer term, however, under the provisions of the 1997 Flores settlement agreement, as interpreted in July 2016 by the Ninth Circuit, even those accompanied alien minors must be released within 20 days, as Vox has explained. To address this, section 3(e) of the EO calls on the attorney general to "promptly file a request with the U.S. District Court for the Central District of California to modify" the Flores settlement agreement to allow DHS to detain family units throughout the pendency of any criminal proceedings of alien adults for illegal entry, "or any removal or other immigration proceedings." This will place the District Court in the difficult position of either rejecting the Justice Department's request to modify that agreement (thereby assuming responsibility for separating accompanied alien minors from their detained parents), or modifying the agreement, which it has shown reluctance to do in the past. The ability of DHS to maintain custody of alien adults throughout criminal proceedings for illegal entry, and the willingness of the district court to amend the Flores settlement agreement, is yet to be seen.